Around the year 1000, Scandinavia embraced European religious, political, and economic culture. Unlike many other regions, Northern Europe chose to become Christian without being conquered by any Christian power. In The Conversion of Scandinavia: Vikings, Merchants, and Missionaries in the Remaking of Northern Europe, Anders Winroth answers the question of how this happened. 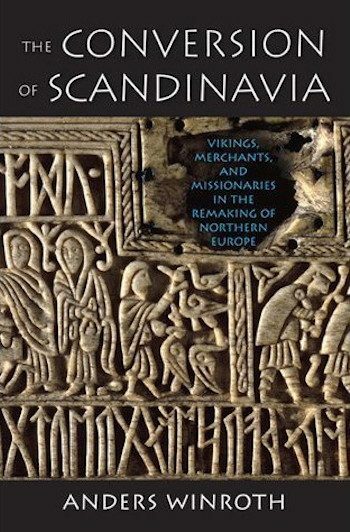 His conclusion is that Scandinavian history differs from the history of the rest of Europe because the process was driven by the needs of chieftains, rather than the persuasive powers of missionaries. This narrative changes much of what we know of as the Viking Age. The popular notion of violent Vikings appropriating the riches of Europe is just one piece of a far more interesting story about Scandinavia. The Conversion of Scandinavia sets forth an original and provocative interpretation, one that makes room for the voices of Northern Europeans and provides a new perspective on the complex history of Europe. Winroth’s is a fresh take on the Vikings, showing people with agency and voices. Sometimes violent, they preferred negotiation. Gift-getting and gift-giving drove their politics. When, in the centuries around 1000, Scandinavians opted into Europe, Christianity was a gift they chose.